It always facinates me that a country which prides itself on it's macho front straps on a load of padding just to play rugby. We don't mind if you consider your sport superior. Now go in the other room while the adults visit. American football's for pansies. Now Aussie rules, that's where it's at! wow you all are sad... their just sports who gives a damn what they're called. i'm an american but i always thought Football was not the right name for that game. Football goes better with Soccer. And i find it dumb to tackle each other for a ball. Just chase it and if you end up with it, then kick it. Ok i am a brit nd i think american football is amazing, but im not gonna have the stupid argument of which is better, coz im not that sad. YEA! Also, why doesn't Cricket have little chirping insects? And I have yet to see any carpets any rugby! Stupid other people! America is clearly the best country ever... and wtf! why did you call the footBALL and egg? Are you retarded or something? These Yank pussies should try Aussie rules football, they wouldn't last 10secs without all that padding & helmets. Basically the picture is right, as far as naming stuff goes. Doesn't mean soccer is a better game. What American football has that other sports don't is the drive: it takes sustained, repeated offensive performance to get anywhere. There's a rising level of tension over whether the success can be sustained all the way to a payoff. It's a constant battle and counter battle to take advantage of your opponent's weakness. Contrast that to soccer. One team kicks the ball down the field. The opposing goalie grabs it (with his hands, in case nobody noticed) and kicks it back. His team kicks it to the other goalie, who picks it up, kicks it back ... repeat for 90 minutes. There's nothing sustained, just a succession of failed attempts. The problem is the goalie has too much power. Good offensive attacks and bad offensive attacks almost always have the same result. Scoring is mostly a matter of getting lucky and catching the goalie out of position. It could be a lot more interesting, just make the goalie play by the same rules as everyone else The defense would have to play a lot tougher, but a team couldn't just sag back and play defense because it would be impossible to stop every offensive attack. Better yet, nobody is allowed in the box in front of the goal. No goalie soccer is a great game. Too bad we're all stuck in a tradition. hahahahaha never really thought of it that way but this just cracks me up!!! 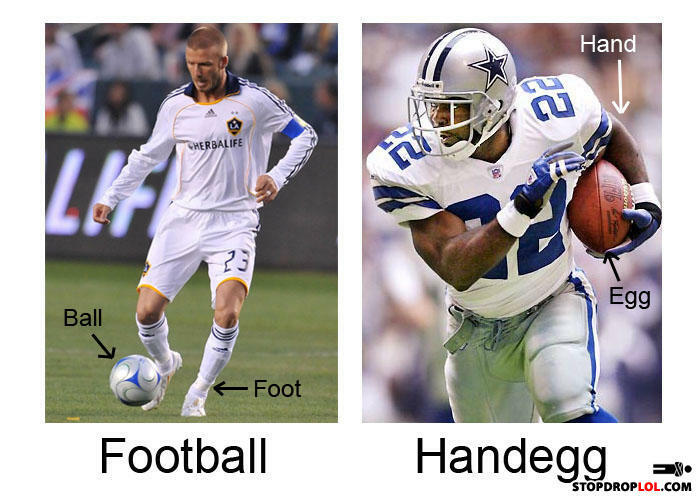 Personally I think the comparsion is incorrect and it should have been rugby V amercian football. Then it becomes clear where the real men come from! Bearsnatch would be a GREAT name for it. i would like to see some rugby douche get hit by mike alstott in a full sprint without pads.. or hey maybe dwight freeney who by the way is 271lbs and runs a 4.3 40 yard dash. so yeah a small cushion to a blow like that might be smart. As far as the names of the game who really cares? ill call it baresnarch it doesnt change the way the game is played. I noticed quite a bit of padding on the cricket players but none on the baseball players...now go put your short pants on and kick the bally to each other. This is why Americans don't like soccer: It's a shapeless, formless back-and-forth scurry, where you run yourself ragged and score only once every equinox or so. It's too much like real life!